Cam & Dursley residents invited to a COMMUNITY IDEAS FAIR! Summer off the Streets is almost here! This means that an impressive number of fantastic fun-filled workshops for children, young people and families will be taking place in Cam & Dursley and across the Cotswolds during the school summer holidays. Activities will include: samba drumming; circus skills; music technology; bushcraft and cookery skills and more. Many workshops will be free but those which carry a charge will only cost £5 per person. In most cases, advance booking will be essential. Full details of the workshop programme and how to book, can be found on the Summer off the Streets website(opens in a new window). In addition to the workshops, there will also be a Summer Skate Park Event at the Jubiliee Field and Skate Park in Cam taking place on the 6th August from 1pm-4pm which will be free for everyone and include DJs, competitions, youth activities and prizes. This will also mark the opening of the new pavilion. Local community and arts organisation World Jungle is organising the programme with support from Gloucestershire County Council. Ben Ward from World Jungle says: “The 2017 ‘Summer off the Streets’ programme provides activities for children of all abilities to have fun, learn some skills and make new friends – there really is something for everyone! We hope that this programme will give young people and families access to some really great events to enjoy over the summer holidays. Cllr Loraine Patrick, Gloucestershire County Councilor for Dursley , is impressed by the range of activities on offer: “It’s good to see so many activities to choose from, and I am sure that children across the area will enjoy them immensely. It is important to give children and young people the opportunity to try something new and to keep active during the holidays.” For more information, please contact Ben Ward from World Jungle on 07889 512644, email ben@worldjungle.org.uk or visit www.worldjungle.org.uk(opens in a new window). Excitement is growing across the town for the launch event of Cam & Dursley’s new Community Cinema. 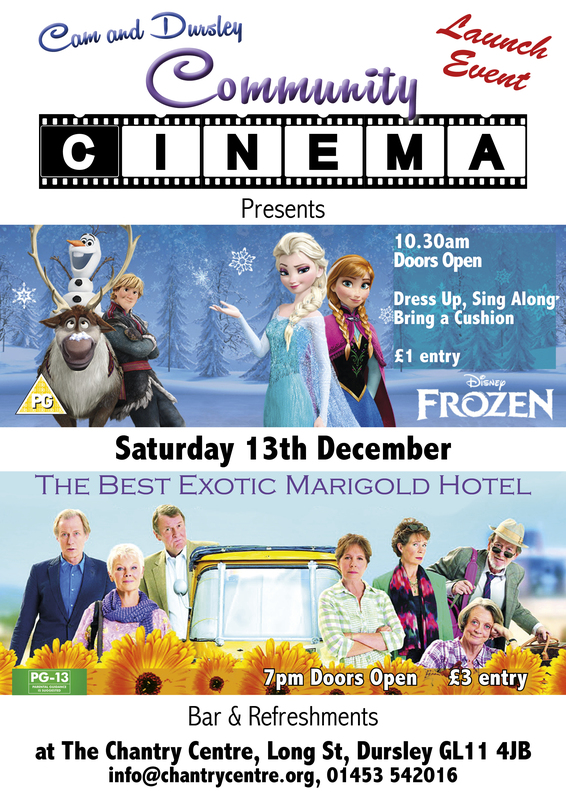 Doors are set to open on Saturday 13 December for a double bill showing of “Disney’s Frozen” in the morning followed by an evening at “The Best Exotic Marigold Hotel”. The cinema is based in Lister Hall at the Chantry Centre in Long Street, Dursley, where a top of the range HD projector has recently been installed. It is run by a committed group of volunteers, keen to bring this wonderful resource to the area and ensure that it becomes a regular feature on the town’s social calendar. “The Chantry Centre has the potential to be an excellent community cinema providing films for all ages especially for those who find it difficult to travel. Dursley used to have a cinema and it would be great to be able to have this again in the town. Doors open for “Disney’s Frozen” at 10.30am, with £1 entry and children are encouraged to get dressed up and sing along too. Please note, children under the age of 12 years must be accompanied by an adult aged 18 plus. Doors open again at 7.00pm for the evening showing of “The Best Exotic Marigold Hotel”, a wonderful feel good film to cheer a winter’s evening. Tickets are £3 on the door and a bar and refreshments will be available. For more information on getting involved in the running of the Community Cinema, please visit Facebook.com/DursleyCinema or contact Ben Ward at World Jungle on 07889 512644 or email: info@worldjungle.org.uk .